That's all cool, but it's the last line that makes this interesting. You can plug this mixer into your computer and it will show up as an audio and video source for any streaming application. So if you need to take a video stream out to LiveStream, for example, it's easy to do. Need to Skype a missionary in? No problem. They included a built-in video player and recorder; both operations will work with a standard SDHC card inserted into the front slot. You can only record or play back at once, however. The unit is currently only Standard Definition and video input and output is either S-video or composite. Built-in frame sync's eliminate the need for genlocking everything. One of the coolest features is the built-in touch screen multi-view monitor. Yes, you read that right, touch screen. Want to take a shot live? Touch the shot on the screen. Could anything be more volunteer friendly? 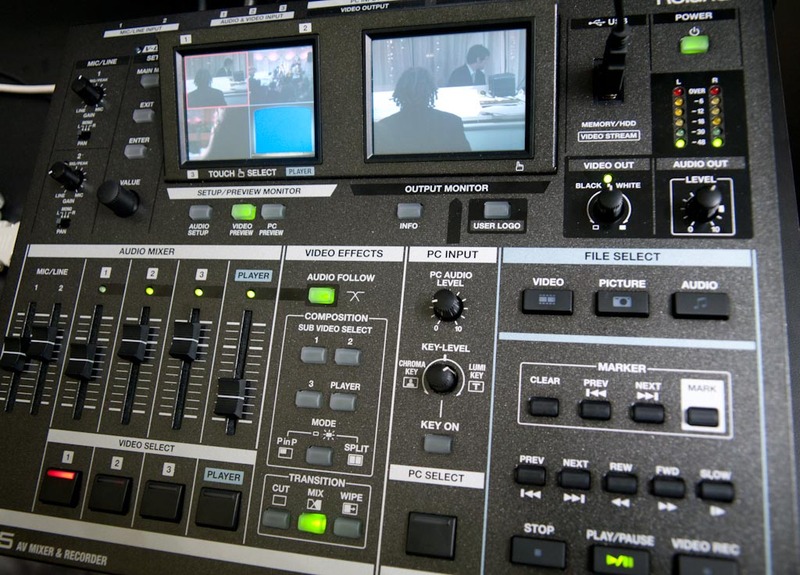 It will also do effects like split screen, picture in picture and downstream keying (chroma or luma). It's an interesting proposition. On the one hand, the absolute ease of sending a mixed stream of audio and video out to the web in one operation is compelling. On the other hand, lack of more modern input signals (SDI, component video) could be a detriment. Generally speaking, for SD web streaming, S-Video is going to be good enough, however, so it will really depend on what you're trying to do. This may not be the ultimate video mixer we've all been waiting for, but for the right application, it could be exactly what's needed.